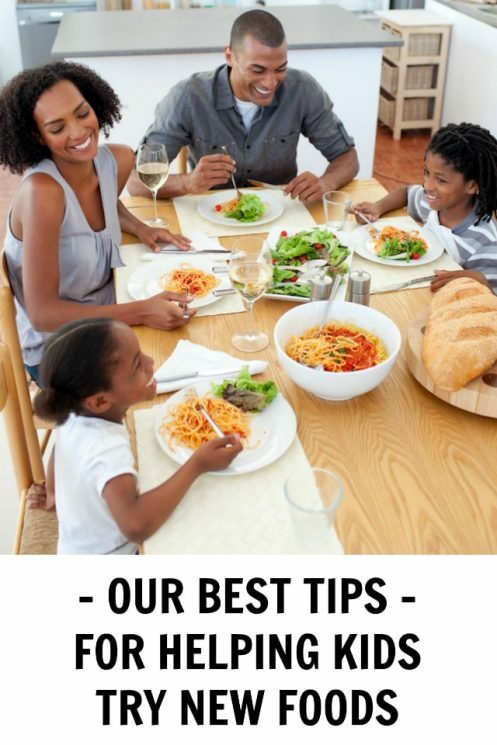 Our best tips for getting kids to try new foods. Dinner doesn’t have to be a fight! Many health-minded parents pride themselves on having children who eat everything from sushi to spinach. It’s a badge of honor that their child will try anything anywhere, or eats a huge variety of fruits, veggies, and foods. For those parents, I want to offer two high fives! Then, there are those of us who, night after night, put a beautiful dinner on the table only to have our sweet little ones turn up their noses at it. You can’t see me, but I’m raising my hand right now! This is how it is at my house! It’s common for many children to go through a picky eating phase in the toddler years, even when they’ve previously eaten a wide variety of foods as babies. They often outgrow picky eating without too much trouble, but it sure can be frustrating to make it through that phase! Picky eating can be such a challenge, whether it’s a persnickety two year old or a twelve year old! Then, there are the problem feeders. If your child eats fewer than 20 foods, experiences anxiety or even vomiting when trying new foods, your child may be what’s classified as a problem feeder. Problem feeding is different than picky eating and may require feeding therapy or different, more gentle, approaches to help you work through. Speak with your pediatrician to get a referral to a feeding specialist if you are concerned about your child’s eating habits or nutrition. I have a picky eater (my newly 3 year old) and a recovering problem feeder (my 5 year old). I know my fair share about feeding therapy. My 5 year old daughter (who has autism) has been in feeding therapy off and on for two years, so we’ve had the chance to work with specialists and therapists to keep her growth on track and to help overcome some of the issues that make eating difficult. I’ve been amazed at how well these techniques also work for my picky eating toddler, too! Do whatever you need to do to reduce stress at mealtimes. See below for strategies on this, but if you enter into mealtimes with the idea that you are going to do what you can to reduce fights over food, the more success and less stress you’ll have for everyone! Your child is likely not refusing foods simply to make you angry. Consider some of the reasons that might be causing mealtime stress. For instance, some children are super-tasters. Their tastebuds are essentially magnified, so some flavors are REALLY strong or bitter to them. They may outgrow this in a few years. Other children experience textural sensitivity, so they may prefer to avoid crunchy, soft, or mixed-textured foods. In the book French Kids Eat Everything, the author mentions that the French have the mindset that children learn to like foods. If they don’t like something on this try, that’s okay! You don’t force the issue, you simply try again (or in a different way) soon. Don’t give up or rule something out right away. Sometimes, it just takes a bit of practice. Present the foods for the evening. Whatever foods you’ve put on the table are the only choices available. Your child can choose to eat anything (or NOT eat anything) that’s on the table. But the only foods available for the meal are the ones on the table. Maybe that means you serve plain pasta in one bowl, the pasta sauce in another, the meatballs in another, the salad in another, and the bread or fruit in another. One child might choose pasta, sauce, and fruit. Another might like meatballs and salad only. 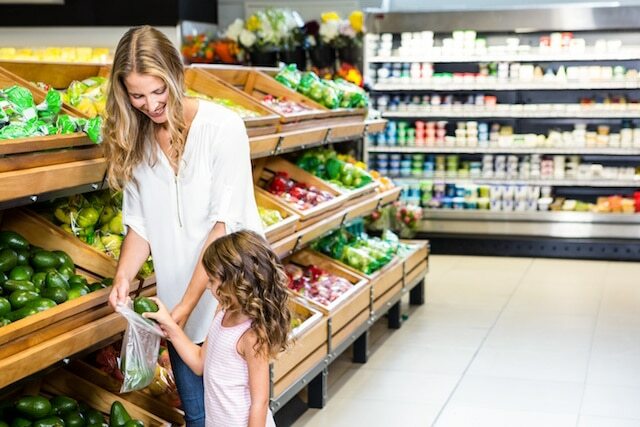 In this one step, you’ve eliminated short-order cooking, handed over some control to your child (letting them choose which foods they’ll eat from what’s available), and you are exposing them to new foods all at the same time. The follow-up to serving meals family style and limiting the food choices to what’s on the table is to always serve a safe food. This is a technique we adopted from Helping Your Child with Extreme Picky Eating. 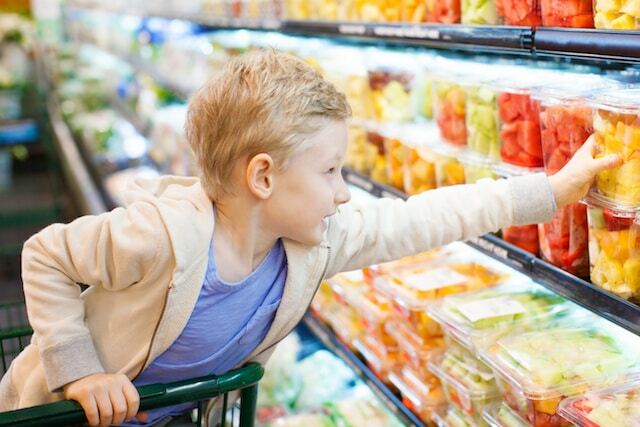 Your child is more likely to try new foods if they know they won’t starve. This also removes some of the fights at the table between parent and child. Maybe they don’t want to try the curry you made, but you know they’ll at least eat the rice. Don’t worry if the safe food doesn’t “match” the rest of the meal. It might mean you have yogurt or bananas on the table even if stir-fry or tacos are the main dish. There are a lot of different ways you can approach this, and you as the parent will know which (if any) will work for you and your family. My son loves bananas and sometimes that’s the only food he chooses to put on his plate. If he wants seconds, I’m happy to oblige; I just ask him to try one bite of something else on the table first. Sometimes, that one bite is enough to get him eating a decent serving something else. Sometimes, he spits that bite right back out. But he’s tried it, and he’s welcome to have seconds of his safe food. Some feeding therapists even suggest having your child give a food they don’t want a “kiss goodbye.” If they don’t want to eat it, that’s okay, they just need to kiss the food goodbye. Children love routine, and especially if you have problem feeding or special needs involved, they may be very (VERY) set in their ways. One gentle way to build on this is to expand on the foods they already like. Sometimes, that’s as simple as changing the presentation (not flavor) of foods they already like. You could cut their sandwiches or fruit into different shapes, buy a different shape of pasta, or try eating frozen blueberries instead of fresh. When you’re ready to move onto the next step, build on modifying the flavors. Does your child like purple grapes? Try serving green ones next time. Children are often more likely to try new foods when they’ve invested in the meal. Maybe that’s gardening with you in the backyard and eating the veggies they’ve grown. Maybe that’s going grocery shopping and letting your child choose a new fruit or veggie each week. Maybe that’s getting your child cooking with you. Sometimes, my daughter will try foods while we’re cooking that she won’t touch at the dinner table. Those little licks, tastes, and bites all add up to more exposure to new foods. And the more often your child tries a food, the better! The beautiful thing about parenting is that you know your child and your family better than anyone. You can pick and choose strategies that work for you. And, if it turns out those strategies didn’t work as well as you’d hoped…well, you can try something else or read through books for helping picky eaters. Be patient. 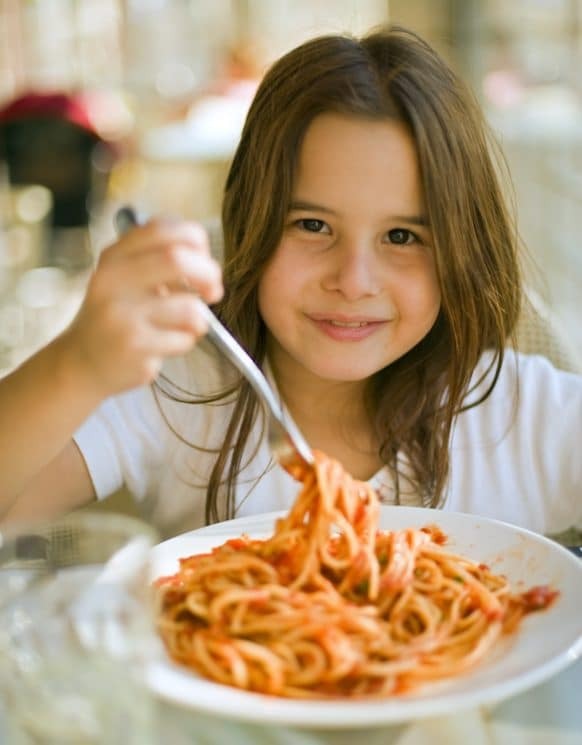 Most children outgrow their picky eating phase with time. 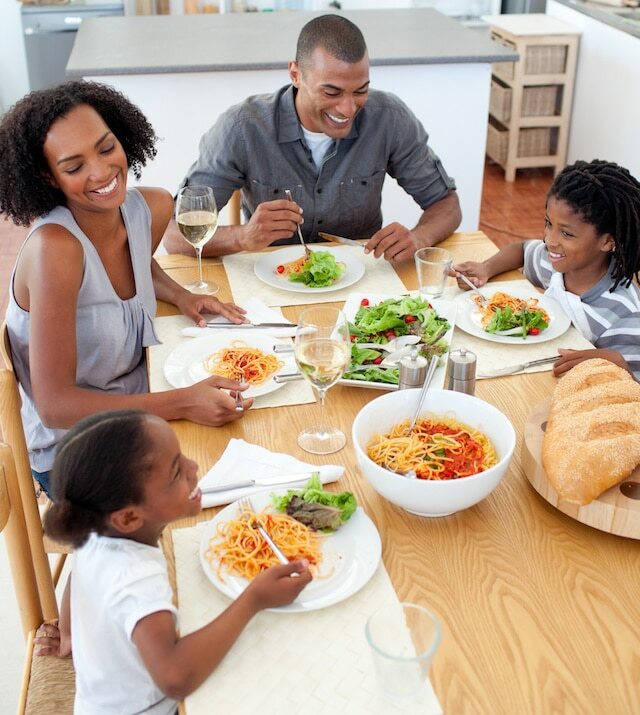 The more pleasant and stress-free you can make mealtime, the more likely you are to move through that phase. If you have any concerns about your child’s growth or nutrition, don’t hesitate to seek professional help from a doctor or dietician. Beyond health concerns, know that you can do this! Emily Dixon writes at One Lovely Life, where she shares healthy food and happy thoughts. This is a perfectly written article. I love it and will share it like crazy—thanks. Getting your children envolved is a key for me—from shopping and having them pick the peppers (picture) to cutting them in the kitchen and serving them on the dining table. The family style idea of placing a variety of items—including ‘safe’ choices is brilliant and something I hadn’t expressed in my writings—although we did it growing up. Super Easy Fruit-Based Snacks for Your Preschooler.